This is a tribute to whales, my favorite cetaceans. They are amazing for many different reasons. Cetaceans evolved nearly 49 million years ago, and have remained essentially unchanged for the past 35 million years or so. In addition to being a fairly old species evolutionarily speaking, whales are some of the most long-lived species in terms of life expectancy. In fact, the bowhead whale, a species native to the Arctic, is the longest living mammal on Earth. Some bowheads have been found with spears lodged in their flesh from failed whaling attempts nearly 200 years ago, and the oldest known bowhead lived to be 211 years old! Another interesting fact about whales that you may have heard: they use echolocation, or biosonar to locate prey and predators. Essentially, the whale emits noises and waits for the sound to be bounced back off of the objects surrounding it, thereby determining what is located where. Echolocation is especially useful for species like the killer whale and the sperm whale, which often live in turbid (hazy) waters where sight is limited. Another fun fact about whales? They have very large brains! For example, the average brain of a sperm whale weighs 7.8 kg, which is the largest known brain mass of any living animal. Due in part to their large brains, whales have exceptional communication abilities, and have been known to create complex loud, melodic sounds which are sometimes referred to as "whale songs". Even whales who are miles apart can repeat these "songs" to one another, changing a few notes here and there for variety, something that fascinates scientists. 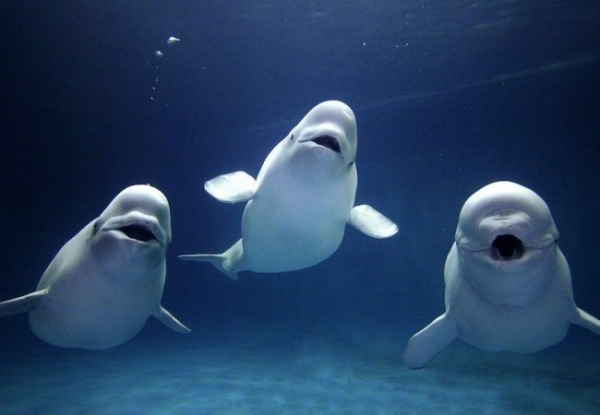 In short, whales are fascinating, beautiful creatures deserving of tribute of their very own.